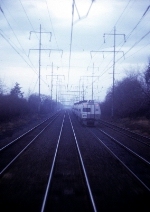 Album Info: Includes state funded trains operated by Amtrak, e.g., North Carolina, Maine, Oregon, and California. Description: Exact day of month not recorded. I could find no data on this car. Info please. 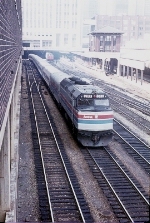 Description: That is the St. Charles Air Line Bridge over the South Branch of the Chicago River in the background above the Amtrak (ex-PRR) Coach Yard with two PC Geeps in it. Description: RailThunder commented: #288 was also unique in that it had HEP generators and no boilers or steam heat equipment. Check out that box on the rear of the unit behind the last fans. Description: PC Geep doing switching. Description: That is the St. Charles Airline Bridge over the South Branch of the Chicago River. 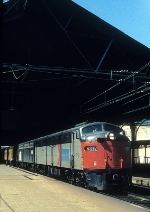 Title: AMTK 435 (ex-Milw 34A) Tr. 325 Hiawatha Service, Milwaukee Ave. Description: Taken from the Sears Tower. 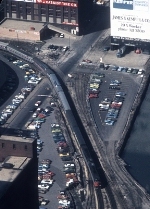 Description: Looks like San Francisco Zephyr cars back in the BN Coach Yard. Title: AMTK 564, Tr. 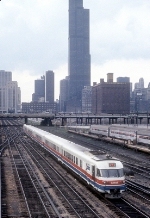 8 The Empire Builder at Touhy Ave. 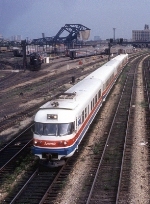 Description: With the Chicago Maintenance Facility in the background as are the St. Charles Airline bridges over the South Branch of the Chicago River. Description: Ex-UP 970B. 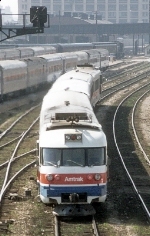 Also carried Amtrak numbers 468 and 669. 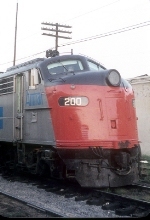 Converted to a head-end power car and sold to Alaska RR and numbered became their P7.